The Mitsubishi Montero Sport boasts rough and ready looks backed up by truck-tough underpinnings and a part-time four-wheel-drive system for serious off-road use. It's tough enough to tackle rugged terrain, yet stylish enough for a night out on the town. For 2002, Mitsubishi adds a full-time four-wheel-drive mode designed to improve traction in slippery or inconsistent conditions, such as snow, ice, gravel, dirt, or rain-slick roads. This all-wheel-drive system enhances the safety of the Montero Sport when bad weather hits civilization. The Montero Sport continues to offer more cargo space than a Nissan Pathfinder or Isuzu Rodeo. You can dress it up or dress it down, with optional leather and an available 3.5-liter V6 that delivers gutsy performance. For 2002, Montero Sport comes in five different trim levels: ES, LS, XLS, Limited. Each trim level is available with two-wheel drive or four-wheel drive. ES, LS, and XLS variations are powered by a 165-horsepower 3.0-liter V6. Even the base ES, which retails for $22,777 for 2WD, $25,087 for 4WD, boasts a long list of luxury goodies. LS ($25,637) adds rear privacy glass, more adjustments for the front seat, a 60/40 split rear seat, larger alloy wheels. LS 4WD models ($27,777) come with four-wheel anti-lock disc brakes. XLS ($27,397) and XLS 4WD ($29,627) bring color-keyed fender flares and other styling enhancements, plus a security system in case the wrong sort of people notice. Limited ($31,317) and Limited 4WD ($32,887) come with four-wheel-disc brakes and ABS, a limited-slip rear differential, plus monochromatic paint, an Infinity stereo, tilt-and-slide one-touch power moonroof, LCD trip computer, leather upholstery, heated front seats, separate rear heater controls. Powering the Limited is Mitsubishi's top engine, a 3.5-liter V6 producing 197 horsepower. For 2002, all four-wheel-drive models are equipped with the new all-wheel-drive system. A Luxury Package ($2310) available for all models adds leather seating surfaces, 210-watt Infinity audio, and one-touch power sunroof. 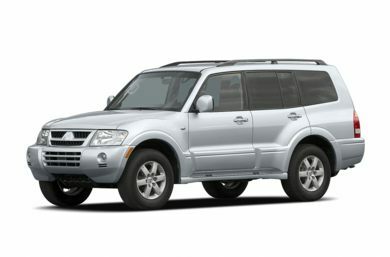 The Mitsubishi Montero Sport is a sporty-looking SUV, with its low roofline, aggressive front fascia and fender flares. It sits high off the road, with more than eight inches of ground clearance, but its roof is only 65.6 inches tall, which is nearly four inches lower than a Jeep Grand Cherokee's roof. Styling is very important to Montero Sport buyers, according to Mitsubishi. The low roof of the Montero Sport is an advantage in tight parking garages, and it's beneficial when loading kayaks or mountain bikes onto the roof rack. The outside door handles on the Montero Sport are small and hard to grasp, however. The Limited model is distinguished by color-keyed fender flares, integrated fog lamps, and color-keyed tubular side steps. The Mitsubishi Montero Sport is about the size of a Nissan Pathfinder. Don't confuse the Montero Sport with the bigger and more radically styled Montero. The big Montero, with its 109.5-inch wheelbase, 104.6 cubic feet of passenger volume, and 5840-pound Gross Vehicle Weight starts near $32,000 and often tops $38,000 with all the options. Our subject here is the Montero's little brother, the Montero Sport: 107.3-inch wheelbase, 93.6 cubic feet of passenger volume, and a GVW of 5000-5350 pounds. This is still no econo-SUV, however, with standard V6 power and a starting price closer to $23,000. Overall, the interior of the Mitsubishi Montero Sport is attractive. Our 2002 Limited model was upholstered in nice light and dark tones. The front seats hold the driver firmly and offer adjustable lumbar support. In the Limited, they come with seat heaters. They don't feel as bucket-like as the front seats in an Explorer or Grand Cherokee, but they seem to keep the body in better control. A trip home after a weekend on the trails is relatively easy on your back, even after you've done things on your mountain bike that your chiropractor warned you not to do. The instrument panel is straightforward. Gauges are easy to read with bold black numerals on platinum-colored faces. We didn't particularly care for the fake wood surrounding the instruments and window switches on our 2002 Limited model. The handbrake lever is spindly and the material in the center console/cup holder area looks and feels like plastic. The tall center console takes up some elbow room and makes reaching the switches to the available seat heaters awkward. And the inside door handles are small. The 210-watt Infinity stereo sounds good. Just to the left of the floor-mounted automatic transmission shifter is the shift lever for the transfer case. Drivers can choose between AWD, 4H, and 4L. AWD is used in all but the worst off-road conditions. 4H is for part-time four-wheel drive to be used in rugged terrain, when there's a chance of getting stuck. 4L is the low-range for steep off-road grades, deep mud, sand or anywhere else ultimate traction is required. Montero Sport's low roofline leads to a more cramped feeling inside. Looking out of the windshield is somewhat turret-like. Headroom is adequate for normal-size adults, but tall people may find it restrictive. In the back seat there's adequate room for three adults and, although the interior is slightly cramped for headroom, your legs will have no complaints. Limited models provide rear heating controls on the back of the center console. The Montero Sport offers more useful cargo space than its small exterior dimensions might suggest. With the seatback raised for passengers, the Montero Sport has noticeably more cargo room than the Rodeo, or the Nissan Pathfinder. With the seatback folded down, there is just a milkcrate less of cargo room than you'll find in Toyota's 4Runner or Isuzu's Rodeo. Mitsubishi's 3.0-liter V6 is a smooth revver, while the optional 3.5-liter V6 gives the Montero Sport more responsive acceleration performance. Accelerating from a standstill, the 3.5-liter V6 makes the Montero Sport feel almost as potent as some of the bigger, V8-powered SUVs. It certainly shows no sign of strain when asked to move its 4330 pounds. Montero Sport handles well on freeway ramps, and on winding roads. The new all-wheel-drive system (AWD) adds to its handling stability in corners. Fewer steering corrections are needed in tight, bumpy corners than what's often required in other SUVs. It rides well on gravel roads. Really big impacts are felt, but you only feel them once and they never leave you with the feeling that you've broken something. The front suspension has adequate travel, so it will soak up uneven railroad crossings with aplomb. However, while you notice very little shake inside, there is enough side-to-side wiggling of the body to remind you that Montero Sport is not a car. Like a truck, it uses body-on-frame construction. Its frame is fully boxed, and its long front torsion bars, beefy A-arms, and hefty rear trailing arms are unmistakably heavy-duty pieces. That said, the most comforting aspect of Montero Sport's ride is the lack of rattles, squeaks, and extraneous movements, which are endemic to most truck-chassis vehicles. (You'll notice them particularly if you are trading in a passenger sedan for your new sport-utility.) In comparison, however, the more expensive Jeep Grand Cherokee and Mercedes M-class wagons hide big bumps the best. On the pavement, the brakes feel terrific, and provide good feedback to the driver. They are easy to modulate around town. When driving off road, you can tell if you're on slippery or sticky roads by the feel of the pedal. Antilock brakes come standard on all four-wheel-drive models, and work well going down steep hills in four-wheel drive, even when low range is selected in the transfer case. New on all 4WD models is Mitsubishi's full-time ALL4-wheel drive or A4WD. Essentially, this is an all-wheel-drive system, which adds stability in slippery conditions because it automatically provides the appropriate traction to the front and rear tires for both on-road and light off-road conditions. Drivers do not need to activate the system. It's always on. It's in A4WD whenever it isn't shifted into regular, old-fashioned part-time 4WD. Driving around town in 4WD will cause the front and rear wheels to fight each other in tight corners, particularly noticeable in tight parking lot situations. In the A4WD mode, however, parking and around-town maneuverability in tight spaces is easier because binding and friction in the system is reduced. A viscous coupling, similar to what's used in Mitsubishi's all-wheel-drive cars, apportions power between the front and rear wheels according to traction needs. All-wheel drive seems to add stability to the Montero Sport when cornering, even on dry pavement. Charge into a corner, such as a freeway ramp, and the suspension is not upset by coming on and off the throttle. This may help the driver maintain control in an emergency maneuver. In other words, all-wheel drive makes for safer handling and easier driver control than two-wheel drive. EPA-estimated highway fuel economy has dropped to 18 mpg from last year's 20 mpg, however. For more extreme conditions, drivers can shift into part-time 4WD as well as low-range 4WD. Part-time 4WD uses a locked center differential to ensure power is being distributed equally between front and rear axles. To enhance traction further, Mitsubishi offers a limited-slip rear differential; it's standard on Limited models and comes as part of the optional Touring Package ($1790) on XLS models, which also includes one-touch power sunroof, 210-watt Infinity audio system, platinum-finish interior trim, and leather-trimmed steering wheel, parking brake lever and shift knob. Mitsubishi's Montero Sport is a stylish package with real off-road capability. Its new all-wheel-drive system gives it improved stability on the road, particularly when it is slippery. The Montero Sport is priced below the larger, more-popular Ford Explorer and Jeep Grand Cherokee, while offering similar performance.